Egg Salad conjures up different images for different people. To some, it’s a creamy and delicious lunch sandwich. To others, a picnic side dish. To others still, it’s that nasty, yellow, mayonnaise-filled goop your Great Aunt Agnes used to make for Easter, and your mother would give you the death stare if you didn’t choke down at least five bites. Fortunately, it’s possible to make egg salad that is lighter, more flavorful, and paleo-friendly! 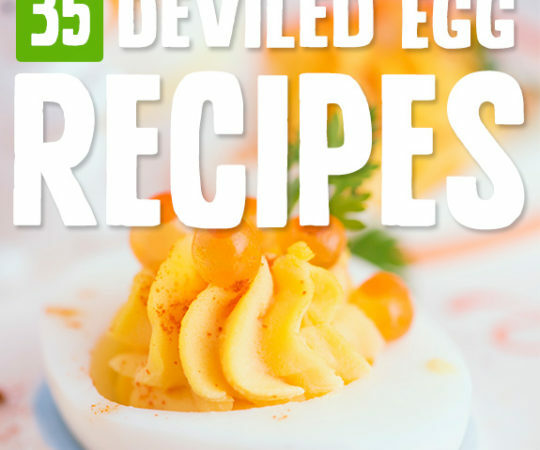 Check out these egg salads and variations on the egg salad theme using ingredients like avocado, bacon, and roasted peppers. 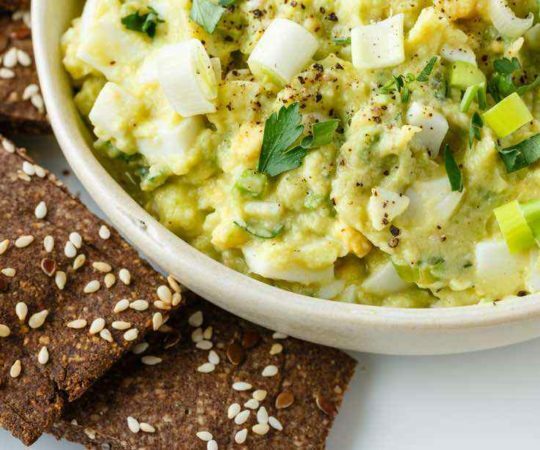 This super easy avocado egg salad doesn’t use any mayonnaise, and is a lighter, healthier way to enjoy egg salad—perhaps spread over a tomato, as suggested! It uses avocado, celery, onion, avocado oil, hard-boiled egg, and a bit of salt and pepper. So simple. 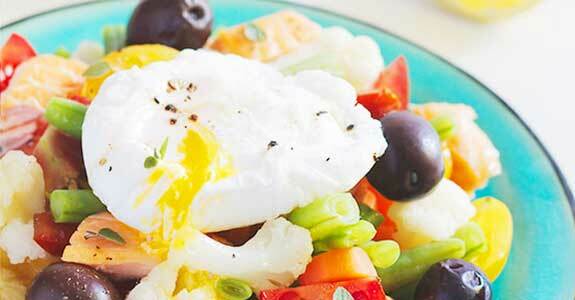 Enjoy this amazing summer salad that is topped with a poached and salmon for a big protein boost. It’s a tasty flavor creation that uses ingredients you’ve probably had before, but never quite in this combination. Wow—this salad is amazing. With small potatoes, quail’s eggs (or chicken eggs if you need to substitute), cherry tomatoes, and green onions, this is a healthy and fantastic salad with a creamy scallion pesto made from tahini with Dijon mustard. This avocado orange salad has a bright and delicious flavor, and is totally healthy with eggs, avocado, red onion, bell pepper, garlic powder, black pepper, and chopped fresh cilantro. Many people believe that essential oils are not safe for consumption, so feel free to substitute a quarter teaspoon of orange extract. This is a more traditional style of egg salad, with mayo and mustard. You’ll want to be sure you’re using paleo-friendly mayo, so choose one with olive oil or just make your own. You can use whatever mustard you like, and the fresh dill is optional. 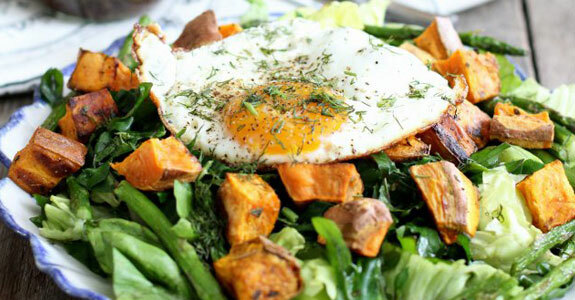 For something a little different than a traditional egg salad, try adding a fried egg to your greens-and-sweet-potato-salad for a healthy breakfast that’s delicious and satisfying. Roasted asparagus adds more veggie goodness, and the red wine and dill vinaigrette is so tasty. This lovely salad is light and fresh, and a far cry from the heavier egg salads many of us usually think of. The quail eggs cook quickly, making this recipe extra easy, and the prosciutto adds an extra salty, savoury taste that can’t be beat. Lime juice and chillies add extra vibrancy. This salad is super tasty with eggs, bacon, tomatoes, cucumber, romaine, and chives. The dressing is delicious and full of good-for-the-gut probiotics, without dairy! It’s made from avocado, garlic, olive oil, and fermented veggie juice. If you don’t have fermented vegetables, you can use your favorite vinegar (you just won’t get the probiotics). Mixed up with homemade, delicious, paleo-friendly mayo (recipe included), this egg salad is studded with spring onions, pickles, and parsley and dropped into delicate little lettuce cups for an easy and healthy lunch that’s packed with protein. This egg salad tastes similar to traditional versions, but it’s made lighter by using Greek yogurt. You can use coconut yogurt or your favorite non-dairy, thicker yogurt if you’d like. With a touch of fresh thyme and sea salt, this is the perfect lunch. This salad tastes like the best kind of bacon, lettuce, and tomato sandwich—the kind that has avocado and is totally bread-free. With hard-boiled eggs, grape tomatoes, avocado, scallions, and ground garlic, you can be on your way to BLT heaven in minutes. This traditional egg salad uses mayonnaise (use paleo-friendly or homemade), Dijon mustard, lemon juice, potassium-rich salt, and kosher salt and pepper to taste. Simple and creamy, and so easy. As fancy as this salad sounds, it’s exactly what the title describes. 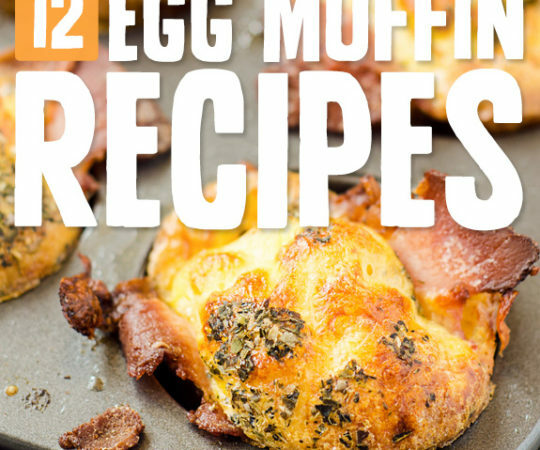 Super simple with only a handful of ingredients! But the flavors are perfect and do have an extra classy feel to them (hazelnuts will do that). 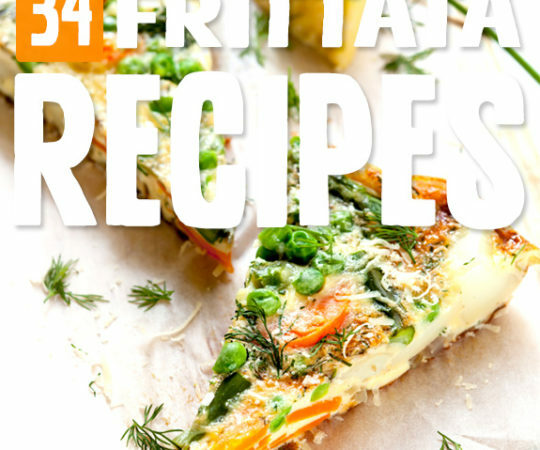 This salad is also keto diet approved, and has modifications to make it diary free (use homemade mayonnaise or, my suggestion—dairy free yogurt). The garlic and Dijon mustard make this salad extra flavorful, and it’s full of healthy fats from avocado and egg. Why not sneak another tasty vegetable into your egg salad side dish, or turn it into a light meal? These tomatoes are packed with an avocado-based, mayo-free egg salad with asparagus tips, smoked paprika, baby spinach, and bacon. 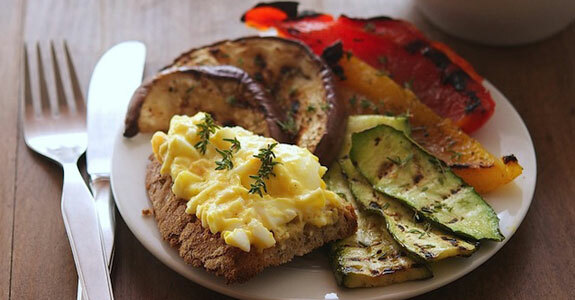 This recipe is for a simple, paleo-friendly egg salad with several variations. Sixteen to be exact! 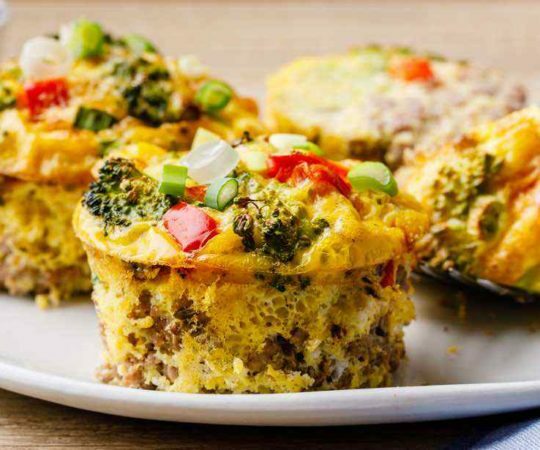 Not every variation is paleo, so you’ll want to pay close attention. But I love the sound of Mediterranean Egg Salad, Confetti Egg Salad, Poppy Seed, or Avocado. 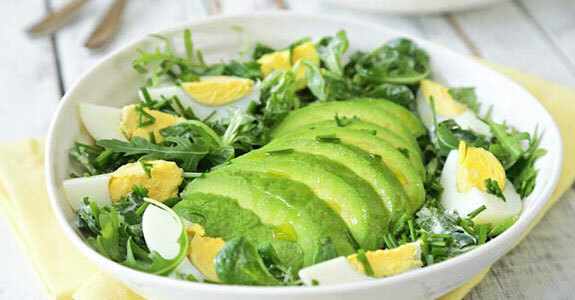 Avocado-based egg salads lend themselves well to spice, because avocado is so cooling and refreshing. This one uses salsa, onion, celery, lime juice, and cayenne pepper! Make sure to use paleo-friendly mayo. 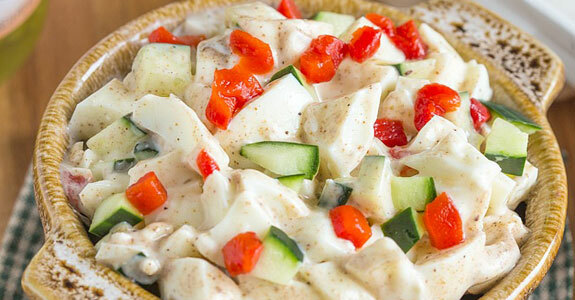 This salad is a copycat version of a spicy ranchero egg white salad from Trader Joe’s. 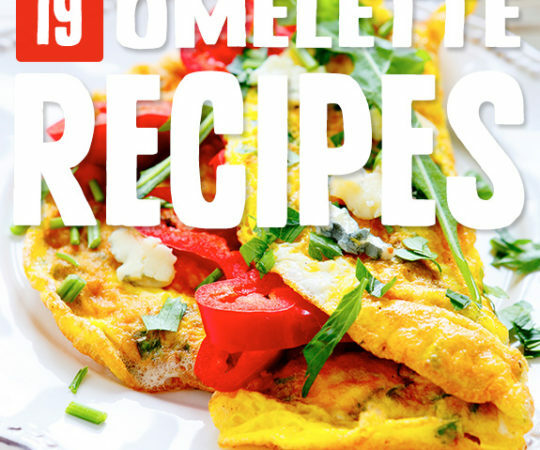 You can use coconut yogurt to keep it dairy free (this blogger did) and it’s extra flavorful with roasted red peppers, red pepper flakes, cumin, smoked paprika, pick brine, and cucumber.